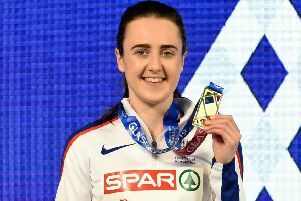 JUST over two seconds and two places separated Laura Muir from a medal in the final of the 1500 metres but there was still satisfaction in spades. It means 2015 will remain a year of nearly-but-not-quites for the Scot who was fourth at March’s European Indoor Championships before coming fifth in Beijing. Better that, however, than the season of not-even-closes she endured in 2014. Small but significant steps have assuredly been made. With a little over a lap remaining in a race as stacked with real talent as any to be found in Beijing this week, the Glasgow University student was a shade off the pace and it doomed her challenge. Genzebe Dibaba, who claimed the world record with a startling scamper in Monaco last month, hit the front and swiped away her challengers. Milnathort’s Muir attempted to make up lost ground but had left herself with too great a gap to close. “I expected it to be hard, it’s a championship final,” Muir said. “There are so many girls in there, you don’t know who is going to do what, but I was prepared for a fast race or a slow race.” It veered towards the latter but the omnipotent Ethiopian won in 4:08.09 by ruthlessly imposing her will. Ahead, Kenya’s Faith Kipyegon held off Dutch hope Sifan Hassan for silver, with deposed champion Abeba Aregawi among Muir’s scalps in sixth, underlining how far she has progressed after imploding at last summer’s European Championships when she failed to survive the opening heat.